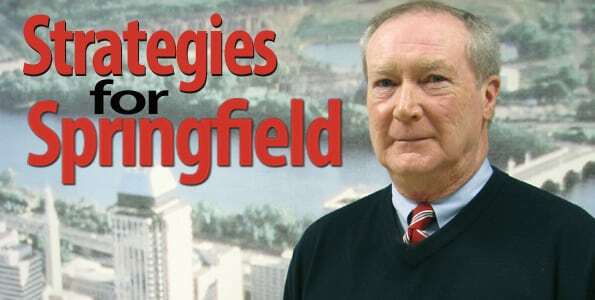 Kevin Kennedy, long-time aide to Richard Neal while he was both mayor of Springfield and the congressman representing the state’s second district, was recently named the city’s chief development officer. In that capacity, Kennedy said he plans to take full advantage of his knowledge of the city, as well as lessons taken from involvement in projects ranging from the building of Monarch Place to the recent State Street Corridor initiative. Kevin Kennedy is still settling into his new office on Tapley Street. He told BusinessWest that he has several blank walls to cover, and is still making up his mind on just how to carry out that assignment. However, there are some items up, and together they tell a lot about the city’s new chief development officer, and also help explain why he’s supremely confident he’ll hit the ground running in his new position. First, there’s the picture of the U.S. team at the first Nike Hoop Summit in 1995. Kennedy, then the head coach at Cathedral High School, is visible on the far left, just a few spots down from an 18-year-old Kevin Garnett. (The event was staged at the Basketball Hall of Fame, and it wanted a local coach to take part). There’s also a framed poster announcing then-President Bill Clinton’s visit to Springfield on Nov. 3, 1996, the so-called Celebrate Democracy event at which he campaigned for himself, but also for John Kerry in his pitched Senate battle against Bill Weld. Kennedy said he was asked to be “protocol chief” for the president and his entourage on that visit. Together, the wall art tells of Kennedy’s long involvement in Springfield politics, sports, economic development, and even architecture. Individually, they speak to passions — basketball (he won championships as both a player and coach at Cathedral), public service, and, yes, Union Station. The courthouse rendering? That symbolizes strategic planning, he explained, adding that the facility isn’t simply a building, but rather one part of a much larger initiative involving the State Street corridor (more on that later). Kennedy said his knowledge of Springfield and all the players there — something lacked by some recent occupants of his office — coupled with his experience taking plans from start to finish and his work on broad strategic endeavors, persuaded him that he was the right person for this job, and especially at this critical juncture in the city’s history. 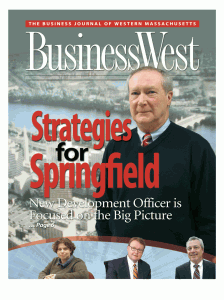 Indeed, 2012 will be a year when tornado-recovery plans are put on the table, many downtown initiatives could take big steps forward, the Union Station project may actually go to bid, and the casino debate — with a Springfield site among many in contention — will intensify. For this issue, BusinessWest talked at length with Kennedy about his new position, his thoughts on what’s next for Springfield, and how to transform plans into reality. Elaborating, he said he wanted to take some of the lessons — and measures of success — garnered from the courthouse and State Street corridor initiatives and apply them to the broad canvas of citywide development. Kevin Kennedy says the state data center now under construction at the site of the former Tech High School is an integral part of a much broader State Street corridor improvement project. “The thing that’s attractive about this,” he explained, “is that you get to combine thinking about things — which you must do because you really have to think ahead — with actually getting something done. And as he goes about applying this glue, Kennedy said he’ll take every bit of experience from his nearly 40 years of service to the city and Neal with him to his new office in the Tapley Street municipal complex. That location is only a stone’s throw from where Kennedy grew up, on Melbourne Street, which no longer exists because the property was taken to build I-291 in the late ’50s. From Hungry Hill, Kennedy’s family moved to the East Forest Park neighborhood, and he attended nearby Cathedral. He graduated from St. Anselm’s during the recession of the mid-’70s and, after a lengthy search for work, found a position with the city through the Comprehensive Employment and Training Act (CETA) in 1974. He started as a personnel assistant and worked his way up to become personnel director in 1978. Soon thereafter, he became the city’s collective bargaining agent and negotiated labor contracts. 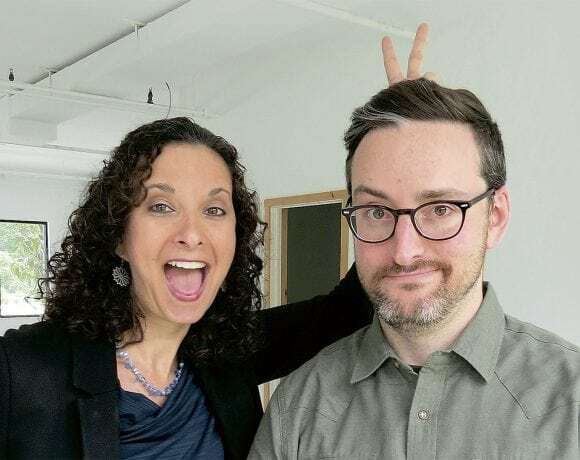 He left municipal service to work for a technology-related startup, Data Management Corp., before branching out into individual data-processing consulting. When Neal was elected mayor in 1985, Kennedy joined him as executive assistant (a job now titled chief of staff), and in that position essentially ran the day-to-day operations of the city. When Neal was elected to Congress in 1988 following the retirement of Ed Boland, Kennedy eventually joined him after first staying behind to facilitate the transition to first interim mayor Vincent D’Monico, and then elected mayor Mary Hurley. He coached at Cathedral from ’85 to ’97, during what he called “one of the golden eras” for local high-school sports. Kennedy said he clearly remembers what he considers the last big event in the Great Hall. It was early in 1977, he explained, when Neal used the facility to announce his candidacy for Springfield City Council. “It still looked good then,” he recalled. “It had declined somewhat, but it was still in good shape, and it was still a special place, one with a lot of history. 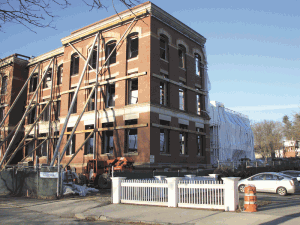 The hall has been seen by only a few people — maintenance crews, journalists (BusinessWest has been inside a few times), economic-development leaders, and representatives of prospective tenants — over the past 25 years, said Kennedy, noting that efforts to revitalize the station do not constitute a project, although many hold that opinion. Rather, he explained, the initiative is an important part of a much broader plan for bringing more vibrancy to the central business district. That plan involves the full length of Main Street — from the South End, where the equation, not to mention the landscape, has certainly been changed by the June 1 tornado, to the Chicopee border. It also involves State Street and many other arteries, said Kennedy, noting that all but a handful of Springfield’s neighborhoods are included in this plan. Elaborating, he said Union Station’s transformation into an intermodal transportation center is one of the links in the chain in downtown revitalization. Some have been completed — 1550 Main Street, the new federal courthouse, and the convention center, for example — but most are still in progress. That list includes Court Square redevelopment initiatives (specifically 31 Elm St.); the Paramount and other endeavors involving the New England Farm Workers’ Council and its energetic leader, Herbie Flores; the vacant and partially demolished Asylum building; and others. Union Station’s redevelopment would be a catalyst for further progress in the so-called North Blocks area, and the North End as well, said Kennedy, who drew an analogy between the current efforts downtown and the ongoing work along the State Street corridor, while returning to the subject of strategy. The new federal courthouse was a piece of the State Street initiative, albeit a big one, he continued, adding that there were and are many other components to that strategic plan. Finding a new use for the abandoned Technical High School was another big piece of the puzzle, he went on, noting that this is why Neal fought tooth and nail to put the state data center (now under construction) there, as opposed to the Technology Park at STCC or anywhere else. “We knew that we wanted to build a new courthouse,” he explained, “and we knew we had to deal with the disposal of the old courthouse. We also knew that, by itself, the courthouse is not a real economic generator, so the congressman came up with the State Street corridor improvement project, which is what really leveraged the investment in the courthouse. Returning to Main Street and the central business district, he said individual initiatives are part of a broader plan there as well. And he believes that enough pieces of the puzzle are falling into place to generate more private-sector investment downtown. When asked about his approach to economic development, Kennedy said he’s adopted the philosophy and operating style of his mentor in this realm. That would be Gerald Hayes, who was the city’s chief development officer in the mid-’80s, and thus worked with Neal and Kennedy to make the Monarch Place project a reality. “I learned a lot from him about how to manage a large-scale project and a small-scale project, and the biggest thing I took from him is the importance of accountability,” said Kennedy. “You convene regular meetings, with assignments of future tasks, and then report on what you accomplished on those future tasks, so you’re accountable. Accountability will be a much-needed character trait moving forward, said Kennedy, noting that there are many large, complex projects — either in progress or in the offing — that will require high levels of coordination between local, state, and federal officials, and could be described as public-private initiatives. Tornado recovery certainly falls into that category, he said, noting that, while the June 1 twister impacted several Springfield neighborhoods, most of the rebuilding efforts moving forward will involve the South End, Six Corners, and East Forest Park areas. A recovery plan is expected from the consulting firm Concordia later this month, said Kennedy, adding that it is likely to spell out specific initiatives for each impacted area. For the South End, where much of the speculation is focused, he expects retail and residential components that will enhance but not change the character of that neighborhood. “I think it needs much of what it had before,” he told BusinessWest, “which means lots of walk-in retail — it used to be the greatest place to go for restaurants — and you still need a housing component to go with it. Union Station is perhaps the most complex of the endeavors, Kennedy explained, because it is involves a number of players, government agencies, and potential funding sources, including a new round of TIGER (Transportation Investment Generating Economic Recovery) grants from the U.S. Department of Transportation and another transportation reauthorization program (one is about three years overdue). If all goes as planned, the project would be completed by 2015 or early 2016, in conjunction with improved and expanded north-south rail service from Southern Vermont to New Haven, with a projected 25 runs a day between Springfield and Hartford going through Union Station. When asked about the proverbial elephant in the room — casinos — Kennedy, sounding much like Mayor Domenic Sarno in recent interviews, said that, while he won’t necessarily advocate for a casino in Springfield, he considers it his job to make sure that Springfield gets the best “deal” possible, whether the casino is built in the old Westinghouse House site, Palmer, Holyoke, or anywhere else. And by ‘deal,’ he meant a wide range of considerations, from preferences on employment to traffic-mitigation efforts; from tax benefits to measures that will help minimize the impact on a host of other hospitality-related businesses. “If you’re in the hospitality business and you’re around a casino, you’ve got a problem,” he said. “Springfield could get hurt, Northampton would get seriously hurt, and Amherst could take a real hit, depending on where this casino is located. While packing up his photo from the Nike Hoop Classic, the Bill Clinton event poster, and the rest of his belongings from his congressional office, Kennedy said he came across his disposition testimony in the legal action involving David Buntzman, former owner of Union Station, and the city of Springfield. “That goes back to 1989,” said Kennedy, noting that, when the city took the station by eminent domain a year earlier, Buntzman sued for greater remuneration. Knowing all of what happened back then, and even decades earlier, may not necessarily help in the current efforts to redevelop the station, he acknowledged, but historical perspective, meaning institutional memory, is usually a benefit. If he can, then he’ll have plenty of new items with which to cover all that wall space.